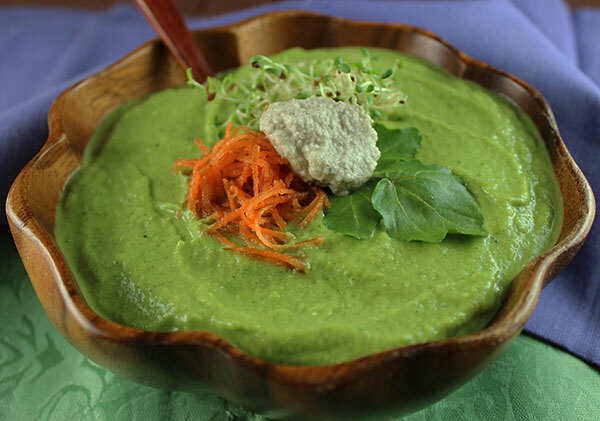 These are two of our favorite vegan watercress soup recipes. One is cooked and one is made from raw ingredients. We typically find that in the cold months we enjoy a warm soup and in the summer a raw vegan recipe version is more appropriate. Watercress soup is a well-known European soup usually prepared with the freshest watercress that is available. 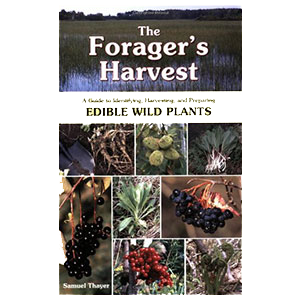 Traditionally, it is made from wild harvested varieties which can be found in many temperate climate zones around the world. Great Britain, in particular, is famed for its historical use of the wild Nasturtium officianale species. Utilized as an ingredient in sandwiches or as a rolled salad green called "poor man's bread", watercress was a commonly foraged food and "multivitamin" source during times of food shortage. Watercress is one of those leafy green vegetables from the mustard family that is best used with blander tasting foods. This helps to balance its strong peppery taste and is one of the reasons it is frequently prepared with potatoes, a common vegan staple. The soup is usually made with quite a bit of greens, often several packed cups of both leaves and stems. It is customarily prepared either as a creamed soup or a simple stock-based variety. Both types are normally puréed and served either hot or cold. Although we harvest our watercress from wild locations, you can also use store-bought varieties. Many produce markets or health food stores typically sell watercress in bundles or as a packaged food item. 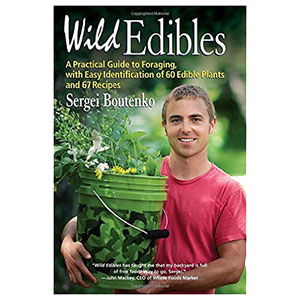 However, in our opinion, freshly picked wild cress is not only far more nutritious than cultivated variations, it is also much more flavorful and one of the best wild edible foods to include in the diet from time to time. 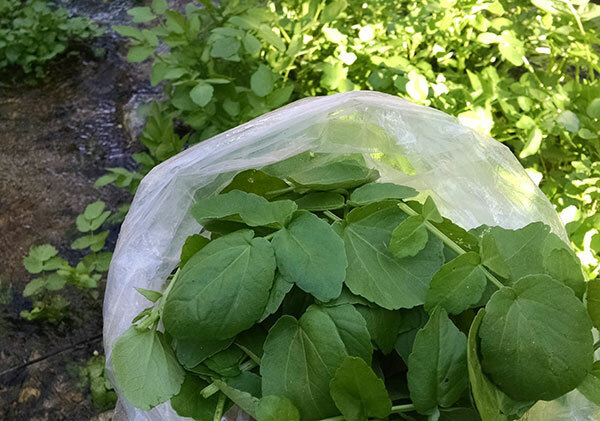 Here are some wild watercress foraging tips, if you do happen to live in an environment conductive to its growth. While watercress is usually abundant and most vibrant in spring-time climates, it is also often available other times of year, including the winter seasons in some regions. Typically, when harvesting off-season cress, we avoid eating thick stems and try to go for younger leaf growth. Once you are accustomed to this species, it is fairly easy to spot, due to its dense abundant growth in aquatic regions, especially shallow slow moving water ways. 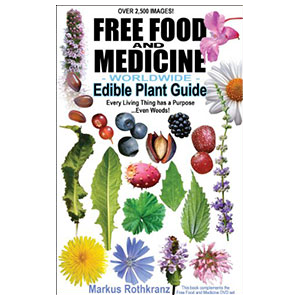 It is also, like other edibles, distinguishable by the flower and leaf shape. 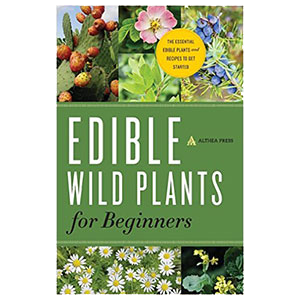 When selecting wild leaves and stems, you can eat the younger rounded leaf growth but more mature oblong shaped leaves are also suitable. It is important to collect your greens from clean water sources away from polluted areas. 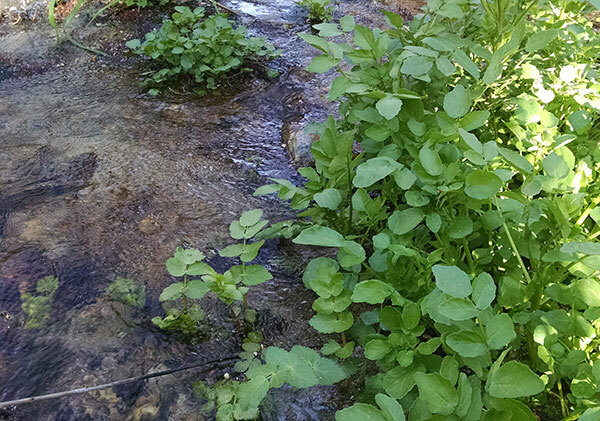 In addition, it is necessary to thoroughly wash foraged watercress, especially if growing near manured livestock grasslands which can increase the risk of parasites like liver flukes. 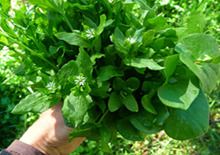 (For more information about this edible green and how to harvest it, visit our watercress page. Watercress or Nasturtium officianale is known to be particularly high in vitamin K in addition to other vitamins and minerals such as vitamin C, vitamin E, vitamin A and folate as well as calcium, magnesium, potassium, phosphorus and manganese. Leaves and stems are also claimed to contain ample amounts of dietary iodine compared to other leafy green vegetables. Watercress tested from cultivated types, according to nutritional information (*), contains omega fatty acids with a one cup serving of chopped raw watercress containing 7.8 mg of omega-3 and 4.1mg of omega-6. 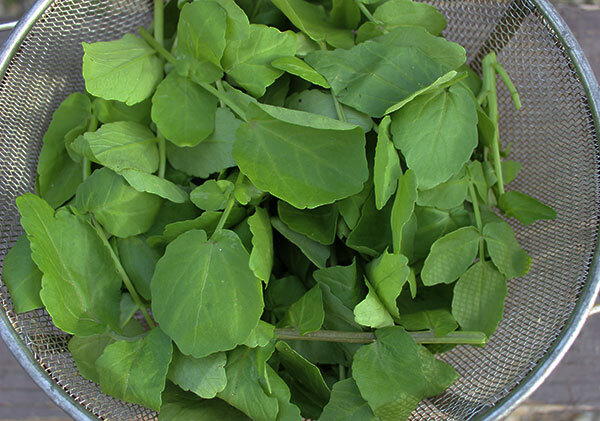 Scientific research shows that the leaves of wild watercress are high in antioxidants, like chlorophyll and carotenoid pigments, as well as various phenolic substances. Watercress is one of the richest sources of gluconasturtiin, a glucosinolate compound that upon chewing produces the substance known as phenethyl isothiocyante (PEITC). 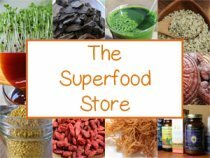 It likewise also contains a high concentration of sulforaphane glucosinolates or SGS, the health enhancing substances also found in broccoli sprouts. 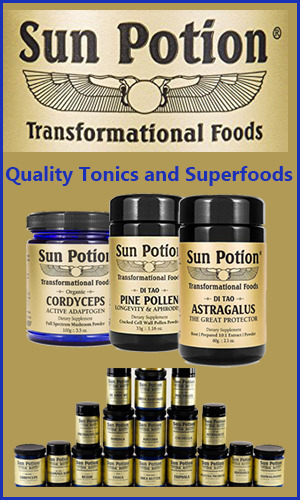 Sulforaphane (SGS) is a sulfur-bearing compound, like MSM, beneficial as an anti-inflammatory that additionally provides effectiveness as a detoxifying cancer-inhibiting agent. 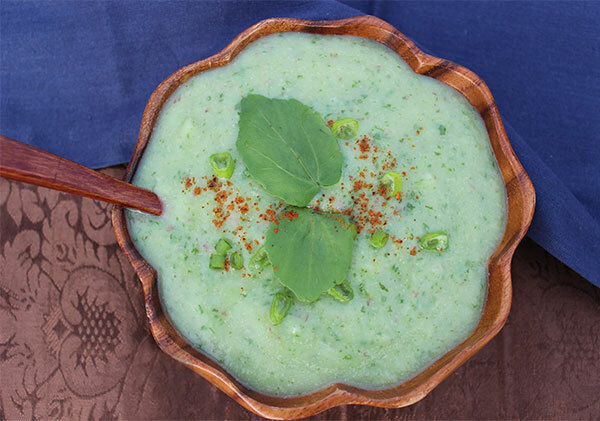 Most watercress soup recipes are about keeping the ingredients fairly simple, just enough to accent watercress' bold zesty flavor. This version pretty much adheres to some of the basic ingredients used in most traditional recipes, minus the chicken stock, butter and cream. We also, of course, add a few other of our superfood favorites, like miso and shiitake mushroom. For a creamier texture we add a splash of nut milk and unheated coconut oil before blending. The leafy green is a nutritious balance to the starchy carbohydrate content of potatoes. We always used scrubbed unpeeled potatoes for added fiber and nutrition, but you can peel them if you prefer. This recipe is also an excellent opportunity to utilized some of the culinary medicinal mushroom varieties, like shiitake, maitake and agaricus. 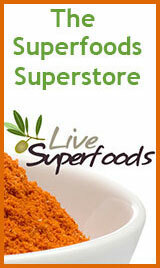 They give it an extra special richness in addition to beta-glucan polysaccharide content. In a large pot, sauté sliced mushrooms, red onion, celery seed, in 1T coconut oil for about 5 minutes. Add chopped red potatoes and continue to sauté for another 5 minutes. Add 2C of pure water and simmer on low heat with a lid until potatoes are soft. Soak your wild watercress for a few minutes in pure water with a little bit of food grade hydrogen peroxide and rinse a second time to remove any impurities. Strain in a colander or spin in a salad spinner. Turn off potatoes and allow to cool with lid on for 5 minutes. After the 5 minutes, add the 2 packed chopped cups of watercress to steam it slightly. In a food processor or high speed blender purée the watercress, potato mix and black pepper, miso, salt, nut milk and 1T coconut oil. Reheat on low flame and serve. This recipe makes two bowels of soup. Garnish with paprika, green onions and watercress leaves and serve as a main meal. It is also delicious with homemade sauerkraut. 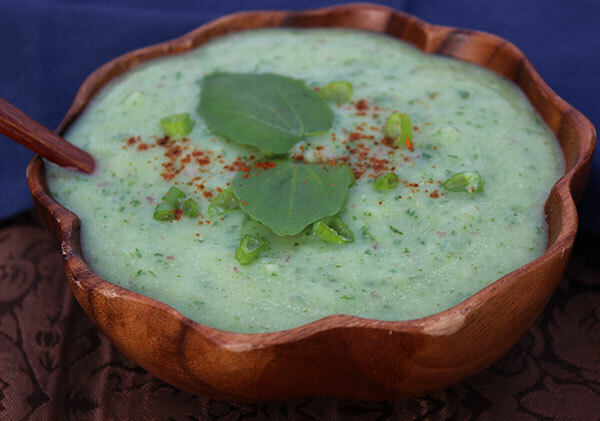 This version is a perfect summertime "raw energy soup" that is refreshingly cooling to the body and makes a nice afternoon snack or main entrée. A creamy blend using avocado, olive oil and lucuma powder, it can be made in advance and kept in the fridge for later use. This recipe requires, of course, much less time than our heated variety. Add all ingredients, including the 2 packed cups of washed chopped watercress to a high speed blender mug, placing the cucumber and zucchini in first. Top with seed cheese, carrots, sprouts and cultured vegetables. This vegan watercress soup recipe makes two small bowls of soup. 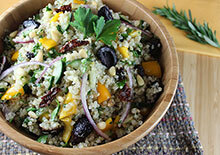 For more raw version of your favorite meals visit our raw vegan recipes page. Excessive intake of raw watercress, especially when juiced or consumed for many days in a row, can cause burning urine and/or loose stools.